As we’ve learned ten-fold with palm-oil, any natural resource can be corrupted in it’s journey from plantation to plate. Cane sugar is no different and, for hundreds of years, bone char from cattle has been used in the sugar refining and bleaching process. The Vegetarian Resource Group estimates that if nine pounds of char is produced by one cow, that the bones of almost 7,800 cattle are used in just one commercial sugar filter. Whether you want to be a more strict vegetarian, newly vegan, or just starting a cruelty-free life, you should know that there are many animal-friendly sugar alternatives out there. And there’s absolutely no reason that anyone should have to use bone-char filtered sugar or honey to make their favorite treats. Sugar beets are primarily grown in the United States and account for over half of our domestic sugar crops. It comes in granulated form but behaves a little differently than your average ‘white’ sugar. The downside? Pesticide use on this crop is really heavy. From 2009-2010, genetically modified varieties of sugarbeet made up almost 95% of all planted crops. Technically, no organic sugar beets coming out of the U.S. 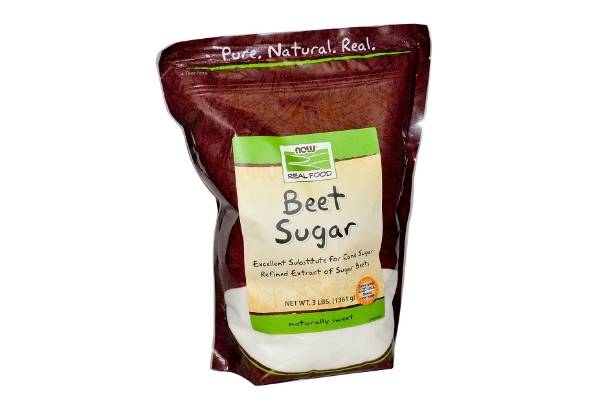 However, it would seem that NOW Foods beet sugar is not genetically modified and is currently seeking verification from the Non-GMO Project. The sweet fruit you soak to make nut milk sweeter also comes in granulated form. Date sugar is a great alternative to brown sugar. These granules are likely smaller than you may be accustomed and are easily powdered in a grinder. Date sugar tastes light and buttery, a bit like raisins, and isn’t too overpowering. You can find Bob’s Red Mill Date Sugar in any Whole Foods but buyer beware, this sugar is packed with oat flour that is untested for gluten. If you have an allergy, we advise you avoid this particular variety. This low-glycemic granulated sweetener is another brown sugar alternative but with a taste much stronger than date sugar. Every time I bake with it, the taste is too easy to detect, in my opinion. If you’re a big fan of molasses, you may take to it though. The only issue? The sustainability of coconut sugar is hotly debated. Here are the most popular pro and con articles on the matter for you to digest on your own. Madhava unrefined, organic, non-GMO coconut sugar is widely available at your local grocer or Whole Foods. This vegan ‘honey’ could fool any bear on the block. Derived from apple juice concentrate, Bee Free Honee comes in four varieties: Original, Ancho Chile, Mint, Chocolate, and Slippery Elm - my favorite. The base almost always contains a mixture of non-GMO vegan cane sugar, lemon juice, and flavor, so it is certainly not a pure product. However, it is fun to have on hand in the pantry for baking and everyday cooking. Drizzle it on some coconut yoghurt for breakfast and you won't be sorry. This is my number one choice for a syrup sweetener. It’s mild, easy to find, and well-priced. Rice syrup is ideal for baking projects like homemade chewy granola bars. It should be noted, however, that rice syrup is pretty nutritionally empty and if you have trouble regulating your blood sugar, then this syrup’s glycemic index will bum you out. Lundberg Sweet Dreams syrup is the brand I usually buy; it's perfect for sweetening cashew milk. This syrup is really distinctive, with an almost ultra-sweet taste. It’s very easy to abuse so make sure you use it with a light hand. Agave is great for sweetening tea, granola, and even cocktails. Be sure to pay close attention the next time you’re in the baking aisle too, some agave nectars are really just over-processed knock-offs, similar to corn syrup. Wholesome! Organic Raw Blue Agave is non-gmo and fair trade certified. It is also not heated past 117 degrees, making it technically raw, which is what matters! The sweetener that will drive your auto-correct crazy. This Andean syrup is actually extracted from a tuber called the yacon plant. It’s relatively rare and a little bit pricey, but just might tout the lowest glycemic index on this list. In fact, it contains up to 50% FOS or fructooligosaccharides, which apparently don't increase blood glucose at all. Sunfood Superfoods' is vegan, gluten-free, USDA organic, and non-GMO, if you're interested. A classic sweetener that is best scrutinized before purchasing, as there are a lot of cheap imitations out there. Real maple syrup can be costly but it is so worth it. Make note of which state or province your syrup hails from; apparently you can taste a real difference between them all. But that might just be a rumor started by maple trees. The syrup above is a good starting point, if you're new to pure maple. Wondering what’s better, Grade A or Grade B? Read all about it here. Molasses is actually just unrefined cane sugar in syrup form that is not filtered or bleached with bone char so that it can keep it’s dark brown color. I have read that all organic cane sugar is considered vegan because bone char is not on the USDA list for allowed substances, but I've never actually been able to find that language on the official website. I would say, to be sure, if you see cane sugar (organic or not) always look for vegan certification as a safeguard. If you're looking for a list of bone-char free cane sugar companies, click here. Whole Foods brand cane is vegan, too. This list may seem a little overwhelming, with it’s pros and cons, but remember that no sugar is really good for you at the end of the day. The point is to use it in moderation and be very aware of the potential animal cruelty or conflict tied to the food you eat. A majority of these vegan sugars are available at your local Whole Foods and most, excluding the date and beet sugar, are pretty affordable. Which is your favorite to cook or bake with?